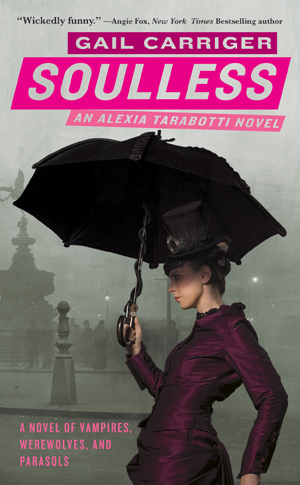 Gail Carriger asks and answers an interesting question in her Parasol Protectorate series: “What if the supernatural was integrated into every day life?” Against the backdrop of Victorian London, the acerbic “spinster”, Alexia Tarrabotti, finds herself in a world that has done just that. Vampires and werewolves have been accepted into society, with some even acting as agents and advisers to the crown. The supernatural set all have an overabundance of “soul” which allows them to survive the transition to immortal. Alexia, on the other hand, was born without any “soul” at all, which means her touch mitigates the abilities of others. When science meets the supernatural, Alexia finds herself in the middle of scheme to understand the inner workings of the soul, and how to use this knowledge to wipe out the immortals, including her werewolf paramour, forever. This was a very fun book and I would definitely recommend it. Alexia’s inner monologue made me giggle, especially as she tries to navigate her relationship with the werewolf Alpha. To borrow a phrase from The Princess Bride, this is definitely “a kissing book,” so if you aren’t looking for romance in your Steampunk you might want to steer clear. That being said, I thought the dialog was intelligent and witty, and the world that Carriger creates is extremely entertaining. Starting in 2012, Soulless was also adapted as a graphic novel with artwork by Rem. I will definitely be picking up Book 2, Changeless. Have you read any of the Parasol Protectorate books? What did you think?